Hi everyone! I hope that you are enjoying (or at least tolerating) the snowy and cold winter weather. Sensitive Husband and I have been busy stimulating the economy by purchasing real estate and a number of various services that go along with it. I must say, based on our recent house-buying experience, that the housing market is beginning to pick up, although slowly. The number of buyers is increasing, although some service providers are still clambering for work. For example, mortgage brokers, real estate appraisers, painters, and repairmen are more than happy to hear about a new house sale, and are available to help at a moment’s notice, which is not the case when the housing market is strong. Needless to say, most of my free time lately has been focused on choosing paint colors instead of trying new recipes. However, spring is almost here, and I am looking forward to more cooking and baking in a new kitchen! If you have been down in the dumps because of the cold winter, cheer up because spring is a mere three weeks away. Late winter is also a wonderful time of year because the maple sugaring season is typically in February and March. Once the temperature reaches above freezing, pressure develops in the tree and causes the sap to flow out of the taps created by the sugar makers. Then with colder temperatures below freezing, suction inside the tree pulls in water to make more sap. When the fluctuations in temperature lessen, the sap stops flowing. This period of sap flow usually falls within early March to mid April. This year the maple sugaring season will be on the later side because the temperatures have been so cold. According to the University of Vermont Extension Department of Plant and Soil Science, sap is boiled to evaporate water and to concentrate sugar. The quality of syrup is affected by the particular season, time of season the sap is collected, and how it is processed. The top quality syrups contain about 66% sugar. Since we received a sampler of maple syrups as a gift, Sensitive Husband and I decided to conduct a taste test of all of the grades since we did not know much about the differences among them. The Grade B maple syrup was the darkest in color and had a rich, smoky taste. The Grade A Medium Amber variety was also quite good, and had slightly smoky and slightly buttery flavors. Grade A Dark Amber was also delicious, with buttery and maple flavors. And the Fancy grade was excellent with even stronger butter and maple flavors. Our taste experiment yielded positive results, in that we enjoyed all of the options! I think Grade B would be best for baking, and the Grades A and Fancy would be good for both baking and pouring over breakfast treats. The trick is to make sure that the maple syrup you purchase is pure, with no added sugars or preservatives, to get the best taste. According to the International Maple Syrup Institute, 2013 produced a bumper crop of maple syrup in most areas with the production of lighter syrups being most common. Total production of maple syrup for 2013 in Canada and the U.S. combined was estimated at 170 million pounds, with about 120 million pounds being produced in Quebec. Maple syrup is a fabulous natural sweetener, and can be substituted for cane sugar in most recipes as a 1:1 swap. 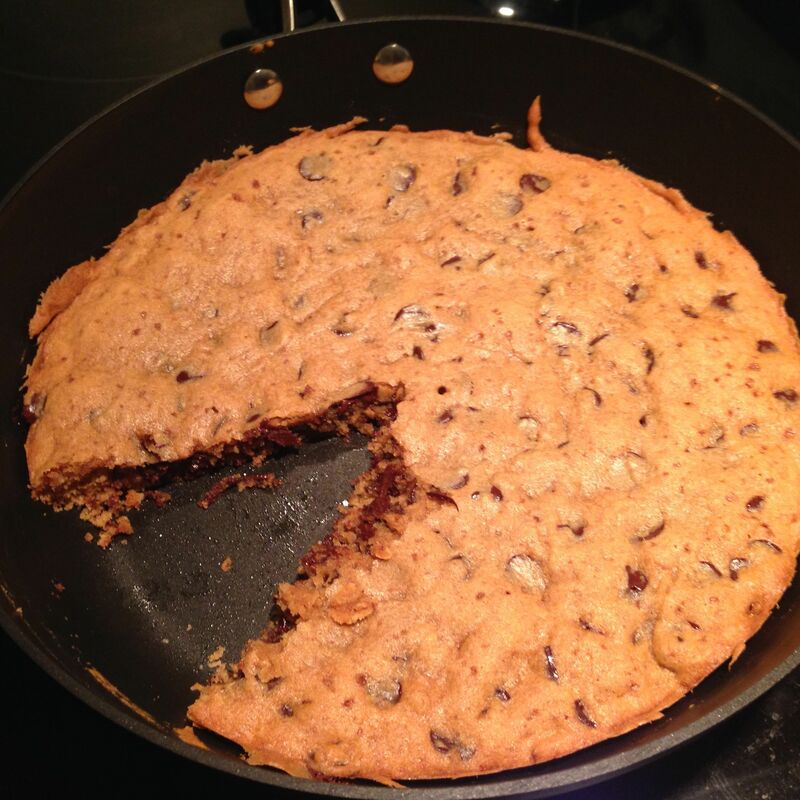 I substituted maple syrup for the sugar in this recipe for a skillet chocolate chip cookie in the October 2013 Everyday Food magazine. 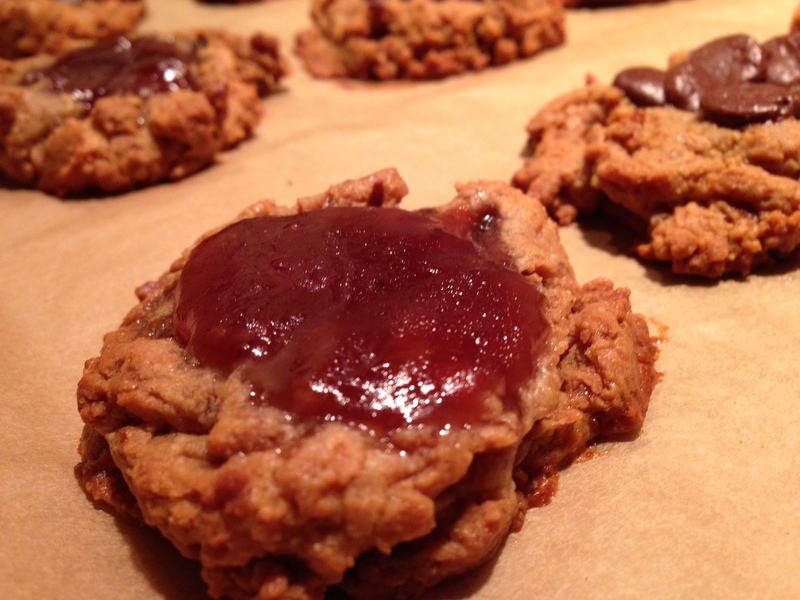 This cookie is delicious and can be made in just a few minutes. I hope that you enjoy finding many ways to use this delicious natural sweetener. Preheat oven to 350 degrees. In a large bowl, combine butter, maple syrup, and sugar with a spoon. Stir in egg and vanilla. Stir in flours, baking soda, and salt. Stir in chips. Transfer to a 10-inch cast-iron skillet; smooth top. Bake until cookie is golden brown and just set in the center, 18 to 20 minutes. Let cool 5 minutes. Good day, everyone. I hope that the new year finds you well. During this time of year I enjoy baking (even more than usual) and the lingering aroma of baked goods throughout the house. These oat bars make a great breakfast or snack. Plus, they are free from gluten, dairy and sugar, so many of your friends will be able to eat them! 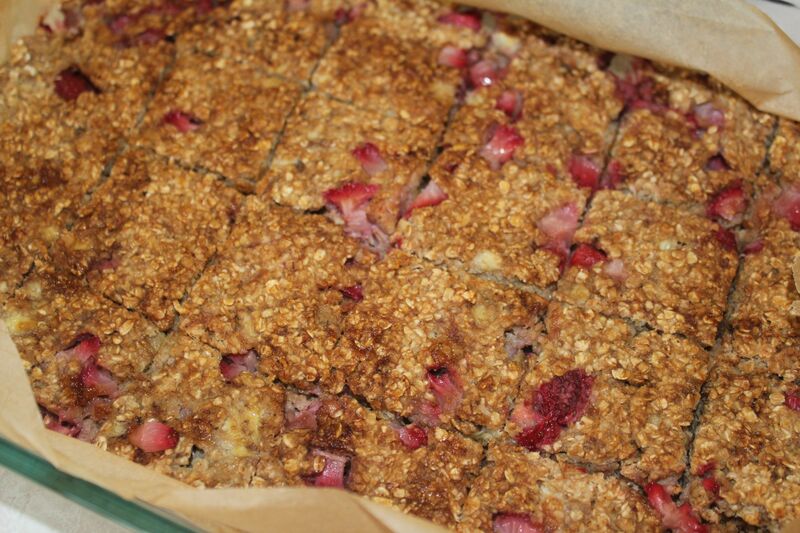 I was inspired by Sweet as a Cookie’s version of Vegan Banana Strawberry Oatmeal Bars. I used the suggested ingredients except I substituted coconut palm sugar for the Stevia, used parchment paper instead of nonstick spray, and I doubled the recipe so that it would fit in my 9×13 pan. You may find that these bars become one of your favorite comfort foods. Speaking of comfort foods, have you voted for your favorite comfort food? It just takes two clicks to cast your vote on sensitiveeconomist.com. Thanks! Preheat oven to 350º F. Prepare an 9×13 pan by greasing with butter or covering with parchment paper; set aside. In a medium sized bowl combine bananas, applesauce, and vanilla extract. Once combined mix in baking powder, baking soda, and cinnamon. Stir in oats until everything is well mixed. Add the strawberries to the mixture and combine. Pour mixture into the prepared pan and flatten evenly with a spatula. Sprinkle optional coconut palm sugar over unbaked bars. Bake for approximately 35 minutes or until golden brown. Cool for approximately 10 minutes. Cut into 10 evenly sized bars and enjoy! Greetings everyone! I hope that you are enjoying the holiday season. Even though I have not blogged much lately, I have continued to bake and cook – some old favorites as well as some new creations. I hope that you have had a chance to do what you enjoy as well. The U.S. Census has put together an interesting collection of facts about the holiday season. I was surprised to learn that more than one half of the potatoes produced in the U.S. come from two states – Idaho and Washington. Also, it is estimated that the value of retail sales by electronic shopping and mail-order houses in December 2012 across the nation was more than $39 billion. In terms of mail, almost 15 billion pieces of mail is expected to be delivered between Thanksgiving and New Year’s Eve by the U.S. Postal Service. The busiest mailing day was December 16, and December 18 was the busiest delivery day. I think it’s fascinating to think about all of the ways that holiday preparations affect the economy. I have been collecting some statistics of my own. Thanks to all of you who gave an opinion in my last poll – how do you like to enjoy apples and pears? Nearly 30% of the respondents enjoy these fruits just the way they are, with no alterations necessary. Approximately 20% of the respondents enjoy the pie variety, and another 20% prefer them in tart form. 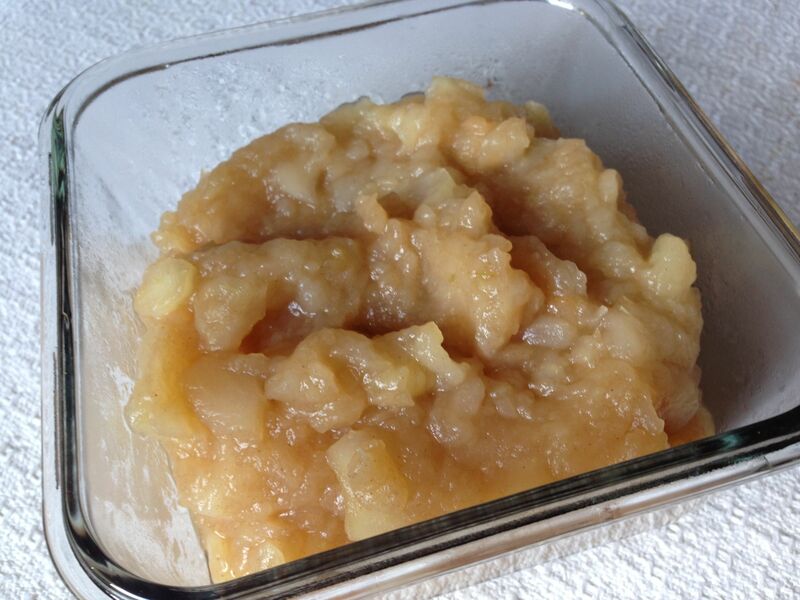 So I think that many of you will enjoy this very easy recipe for Cinnamon Applesauce, because it tastes very fresh and similar to pie filling. Start with about 12 apples. I like using Macouns because they are crisp and sweet, but you can use your favorite variety for the applesauce. The most time-consuming part of the applesauce process is peeling, coring, and slicing the apples. 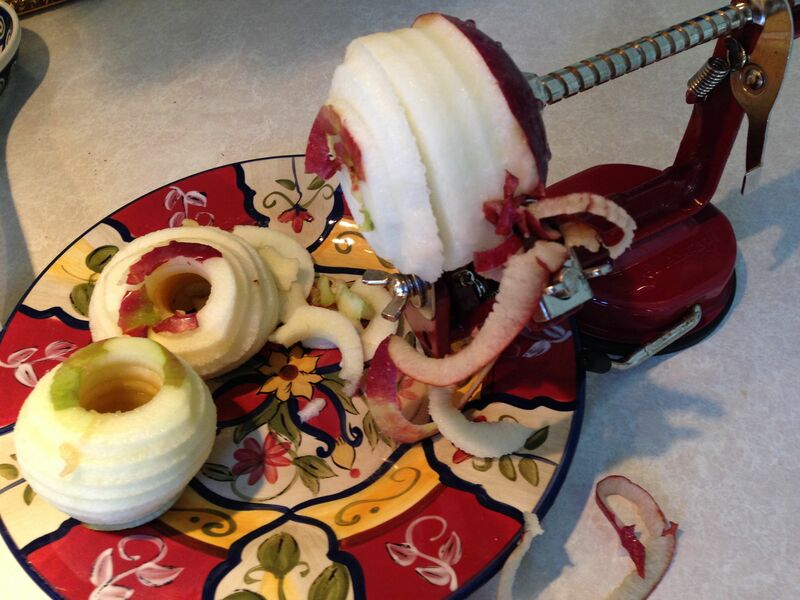 However, if you have a trusty Apple Corer-Slicer-Peeler, then this step takes about five minutes. If you enjoy making applesauce or any other apple recipe, you will enjoy cooking even more if you have this great gadget. 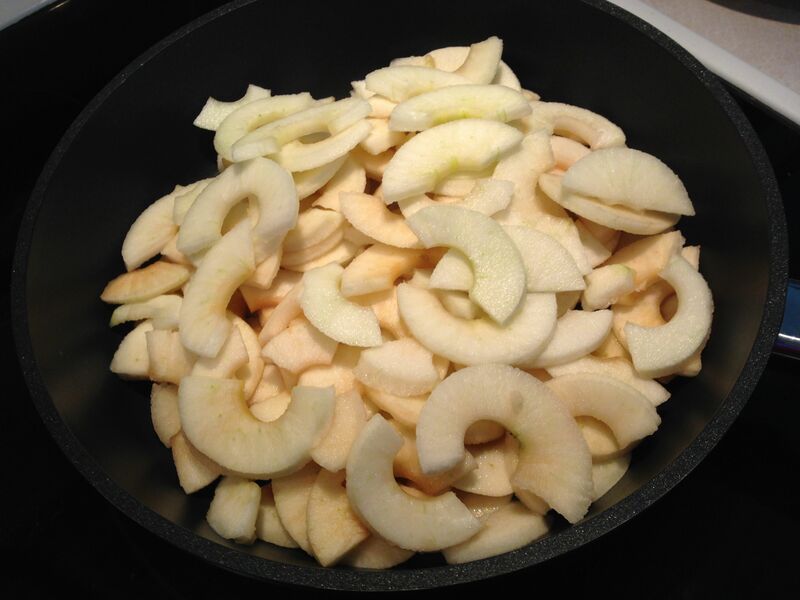 After the apples are peeled, cored, and sliced, place them in a large skillet or saucepan, and cook on medium high heat until the desired consistency, stirring occasionally. Since my apples were sliced rather thinly, and I prefer the end result to be a chunky applesauce, the cooking time was about 20 minutes. However, it can take 30-45 minutes if you have large slices and prefer smooth applesauce. Once you have the desired consistency, stir in 3/4 teaspoon of cinnamon. The approximately two cups of applesauce is now ready to eat, and can be stored in the refrigerator for up to one week. I find applesauce to be a very comforting and satisfying accompaniment to my dinners, especially meals that involve pork roast. I hope that you enjoy this dish too, fit for either a fancy dinner or a regular one. Speaking of comforting foods, what is your favorite comfort food? This question is the subject of my latest poll, which can be found on the middle of my blog’s home page. To respond to the poll, simply choose one answer from the list (or write in your own) and click ‘vote.’ You will then see how your answer compares to the ones already recorded. I am interested to see what will be the favorite comfort food! Hello, everyone! I hope that you are enjoying a beautiful day. The weather forecast predicted clouds and rain yet we have sun and a warm temperature. I am keeping myself busy with a bit of baking rather than thinking of decreasing my estimates for GDP growth due to the federal government shutdown. Early fall is a good time to use fresh pears and the last of the season of fresh figs. If you can’t find fresh figs in the grocery store, a dried version will also be good in this recipe. If you prefer an alternate dried fruit, apricots or raisins would work well too. My inspiration was Five and Spice’s version of Pear and Fig Morning Muffins since the pictures looked delicious. I substituted the all purpose flour with a combination of whole wheat and oat, swapped the butter with canola oil, added some cinnamon, and used plain yogurt instead of buttermilk. Yes, these ingredients worked out very well together. Hopefully our federal legislators will work together soon too. If you have not yet answered my current survey, please do since economists really thrive on analyzing survey results. Just visit my homepage and in two clicks you can provide an opinion to your favorite way of enjoying apples and pears, along with seeing the current tally of results. Thanks! In a small-medium bowl, combine the flours, baking powder, baking soda, salt, cardamom, and cinnamon. Set aside. In a medium-large mixing bowl whisk together the honey, egg, and egg yolk for a couple of minutes, until the color lightens. Then whisk in the canola oil until well combined. Finally whisk in the yogurt. Pour in the dry ingredients and stir together with a wooden spoon. Add the chopped fruits on top of the batter. Stir just enough to mix it in, then stop. 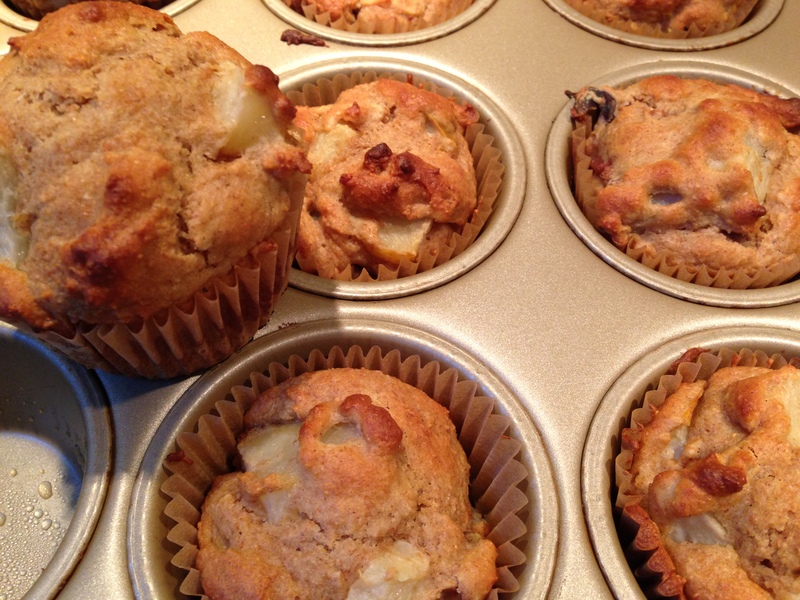 Use 2 spoons to drop heaping spoonfuls of batter into the lined muffin tins. Bake for about 20 minutes, until golden on top and a toothpick inserted into a muffin comes out clean. Makes 12 muffins. Happy Fall Equinox, everyone! Our weather is absolutely spectacular and we are enjoying a bounty of fresh fruits and vegetables. SensitiveHusband and I are stretching out the summer feeling by being outside and making some fresh foods that freeze well. 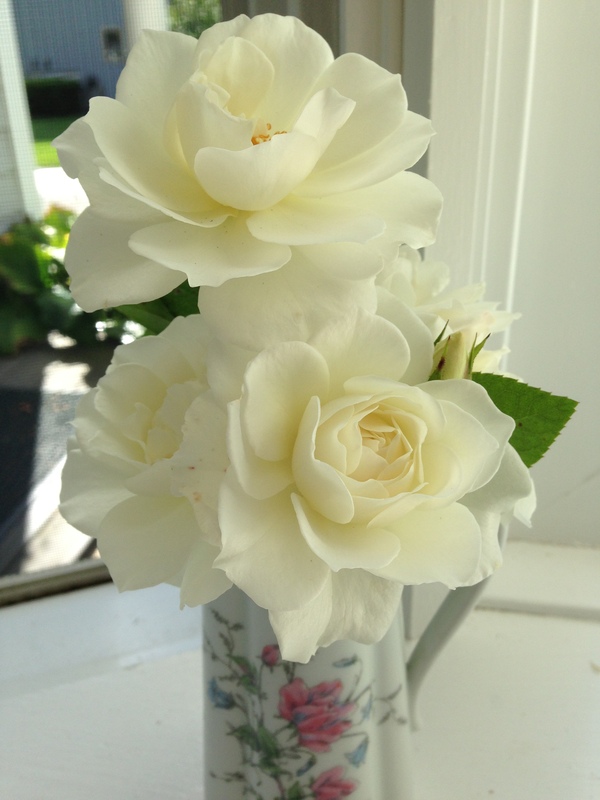 These roses are from my garden – they smell like honey and look pretty and delicate. 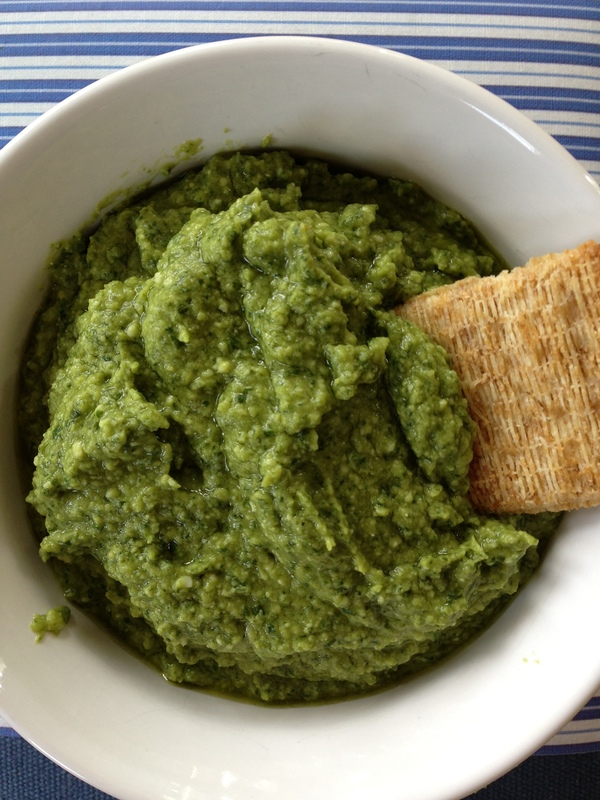 One of the summer foods that we have been consistently eating is pesto. We like fresh pesto as a replacement for mayonnaise or mustard on a sandwich, and it’s also great on a cracker or carrot stick. Pesto is really quick to make although the first time I felt like making it I did not have any pine nuts, a common ingredient, on hand. 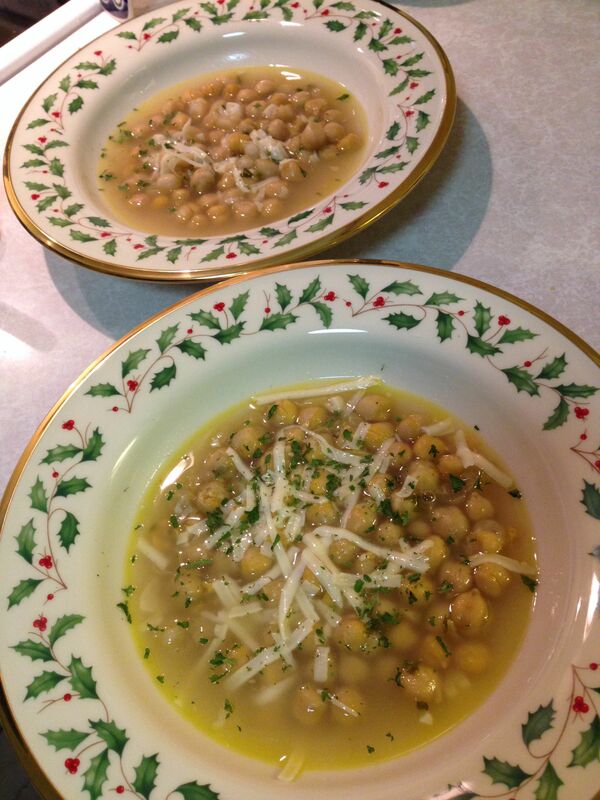 So I found inspiration from the Farmers’ Almanac – and used chickpeas instead! 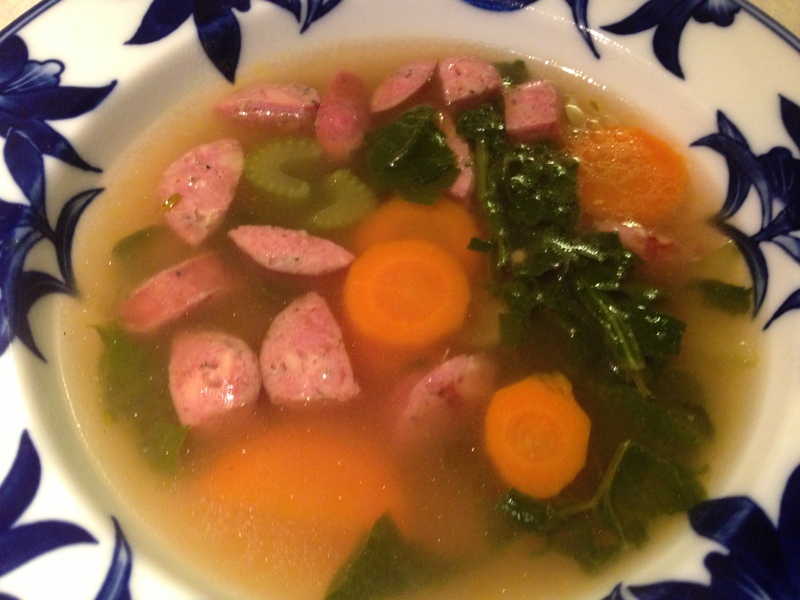 Here is my interpretation of a summer favorite that can easily be frozen and savored throughout the cooler months. To prepare, place all of the ingredients in a food processor and pulse until desired consistency. Store in the refrigerator for up to one week or freeze for later use. Another way to prolong the summer foods is by making a granita, which is similar to a frozen ice. The results for this next recipe is from you and everyone who shared an opinion to the poll question: What is your favorite summertime food? The results were close, although watermelon won out with 27% of the votes. 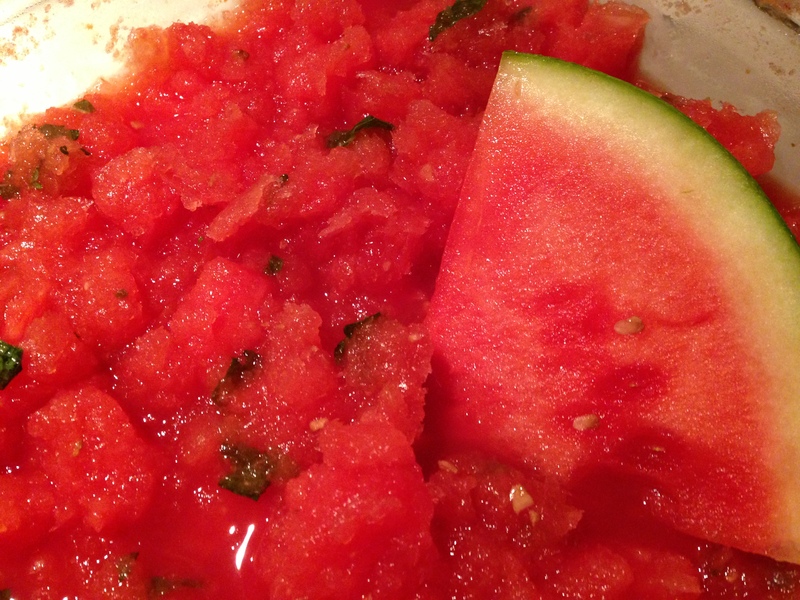 I found a recipe for a watermelon granita from Ellie Krieger, and instead of using cane sugar I used agave nectar. This is a nice way to sweeten watermelon that is not quite as flavorful as it was during the height of the summer, and you can keep it frozen for awhile and enjoy as the temperatures turn cooler. The first time I made the granita, I thought the flavor of the mint was overwhelming so the recipe below tones down the amount used. To prepare, puree watermelon in a food processor. Strain puree through a sieve and strain out solids, forcing liquid out with a wooden spoon. Discard solids. Combine the watermelon puree, lime juice, mint and agave nectar in a 9 by 13-inch metal pan. Place mixture in the freezer, scraping thoroughly with a fork every 30 minutes for about 2 1/2 hours, or until the granita resembles coarse crystals. Scrape 1 last time and spoon into parfait glasses or bowls. Top with a mint sprig. Good day! I hope that this blog post finds you doing well. I have been trying some new recipes over the past few weeks and trying to keep up with all of the CSA produce that I receive each week. The weather this summer seems to be conducive to leafy green vegetables, which always make my day. Now that the temperature is heating up, corn, tomatoes, and beans are plentiful. I have also been working on a baking project – how to make pies without refined sugars. The fillings can be challenging because it can be tricky to get the correct consistency. And I have not been able to use any graham cracker crust recipes because virtually all call for crumbled store-bought graham crackers – and I have not been able to find a brand without sugar. So I had to take a more proactive approach in order to bake a sugar-free crust. SensitiveHusband recently purchased a lovely cookbook for me called Make the Bread, Buy the Butter by Jennifer Reese. The author has made dozens of popular foods and calculated how much it costs to create them homemade, and then compared the cost of similar store-bought items. Based on the difficulty of the homemade preparation and the cost, the author then recommends either making the item or buying it. Fortunately she includes a recipe for honey graham crackers. According to her calculations, homemade graham crackers cost approximately $0.18 per ounce, Honey Maid Cinnamon Grahams are $0.23 per ounce, and Annie’s organic graham crackers are $0.53 per ounce. I adapted the recipe to remove the refined sugars by replacing with coconut palm sugar, and figured out how to roll into two crusts rather than shape into crackers (although you could still use this recipe for crackers). This recipe yields the lightest and tastiest graham cracker crust – the best I have ever sampled. SensitiveHusband agreed that this crust is terrific. Step 1 for baking pies is having a great crust, and the recipe delivers. This is definitely more labor-intensive than purchasing a box of graham crackers, but the taste of the homemade version is worth it. 1. Stir together the flours, wheat germ, salt, baking soda, and cinnamon in a medium bowl. 2. In another bowl, beat the butter, sugar, and honey until fluffy. Add the dry ingredients and stir well. Turn the dough onto a floured surface, knead once or twice, then flatten into a disk. Wrap and refrigerate for at least 30 minutes and up to overnight. 3. Cut the dough into two portions. On a floured surface, roll one portion of the dough into a circle that is about 1/8 inch thick. 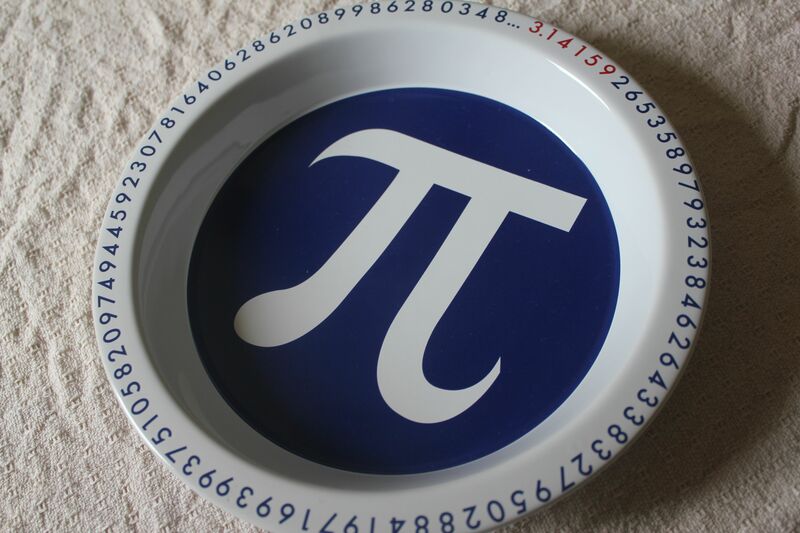 Transfer to a pie plate and remove any dough that hangs over the sides. Prick the dough with a fork in a number of places throughout the dough. Repeat this process with the other portion of remaining dough. 4. Bake the two crusts in an oven that has been preheated to 350 degrees F for about 12 minutes or until very lightly browned. 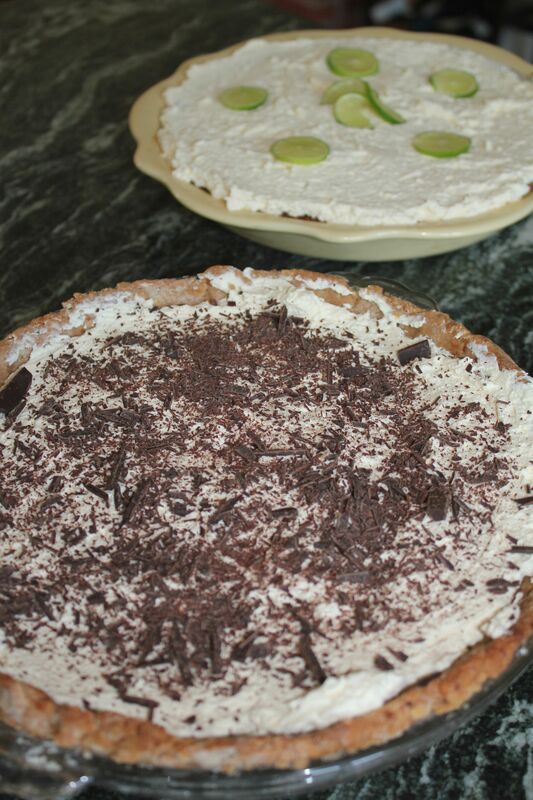 Make sure the crusts are completely cooled before moving onto creating your pie fillings.